Our 50 Greatest Football Shirts Ever countdown has reached the last five - the best five shirts, according to the beliefs of the judging panel. For that reason and that reason alone, we thought we'd share all of our comments for each of the last five shirts, rather than letting one of us divulge our thoughts as a representative for the panel. 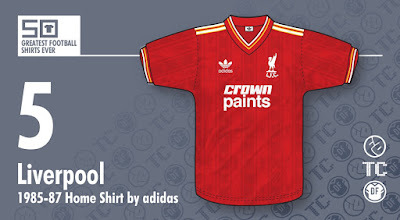 With that in mind, we enter the home straight beginning with Shirt No.5 - the Liverpool home shirt worn between 1985 and 1987. [Rich:] The first ever football match I watched on TV was the 85/86 FA Cup Final, where the team, supported by half my family, lifted the trophy in this excellent shirt, To me it is the ultimate 80's football shirt - a classic V-neck with multi-coloured trim, super shiny fabric, a detailed shadow print, vibrant colour and finally a memorable, but not super-corporate, solid British sponsor. As if it wasn't perfect enough, adidas had their famous three stripes adorning only the shoulders, rather than running all the way down the sleeves... and once more were outlined in yellow, rather than just plain white. This shirt saw Liverpool do the double, though for the following season (after I'd abandoned them for Coventry... probably a coincidence), the blue half of Merseyside took the league title and some plucky upstarts won the FA Cup. The 80s... crazy times and super shirts! [Chris:] I'll be honest. This isn't my favourite Liverpool shirt ever. That would be the one that preceded this - the famous 'pinstripes' kit created by Umbro. When this one arrived in 1985, however, it was like an acknowledgement that football kit design had reached full maturity. After the extravagant flair of the 70's and the tentative styles of the early 80's, adidas showed with this shirt that it was finally time to get serious about looking good on the field. Everything about this shirt says 'grown up'. The shadow pattern, the detailed trim, the use of yellow as a generous nod to the Umbro away kit used between 1982 and 1985... it all embodied a big leap forward to leave behind those 'so yesterday' pinstripes. A fine shirt and one of Liverpool's greats. [John:] As a young Liverpool fan when the news came out that the club had signed a deal with adidas, I could almost not comprehend that Umbro, who had accompanied the Reds throughout their glory days, would not be producing the team kit. The anticipation to see what adidas would do with the famous red was almost too much to bear. When I first saw the strip though, unveiled via a double page-poster in Match magazine, I breathed a sigh of relief. It was a stunner. And the away and third kits that also appeared on the poster were pretty decent too. 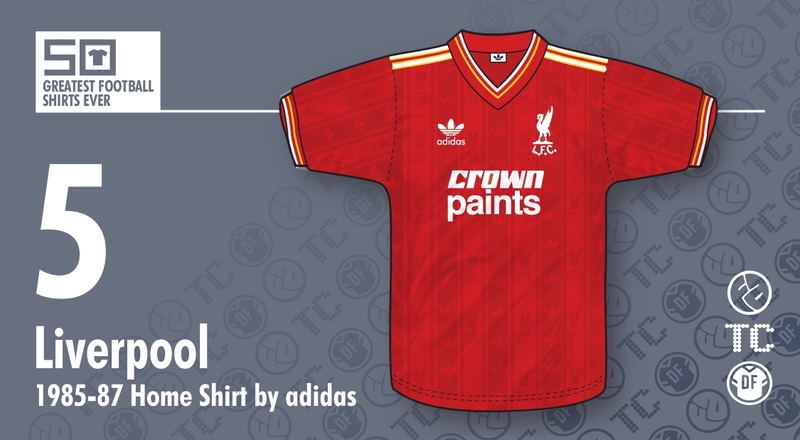 Style personified - with the merest touch of yellow bringing to life the trim and the innovative Liver Bird and adidas trefoil logo shadow pattern, it was truly magnificent and, at least in my eyes, it was better than the Umbro kits that preceded it. The task facing adidas in 1985 was huge but they passed with flying colours. [Jay:] Aside from seconding the words of my esteemed colleagues, there's not a whole lot I can say about this shirt. adidas just simply got it right in the 1980s, and the subtle combination of white and yellow trim, along with definitive versions of the adidas logo and simple Liver bird ("L.F.C.") crest, with hindsight, propels this offering into the stratosphere of shirt design. adidas knew this, and added a - we'll assume knowingly - inaccurate recreation of this release to their Originals range a few years ago. That was disappointing, as I wouldn't want to change a single stitch on this masterpiece.